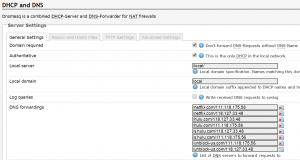 If I want our general internet DNS queries to go through OpenDNS, but the Chromecast to use a Smart DNS service, can I set the default DNS to the OpenDNS servers and then use the two iptable commands above to the DNS server of my Smart DNS provider? You should be able to set the OpenDNS DNS servers at the WAN connection level, which means all other request will be resolved using OpenDNS. I’m no iptables expert but I imagine you could add the request IP in that mapping so that explicitly only Chromecast traffic (E.g. 192.168.1.50) goes to the Unblock-US servers — though the dynamic IP might also change. 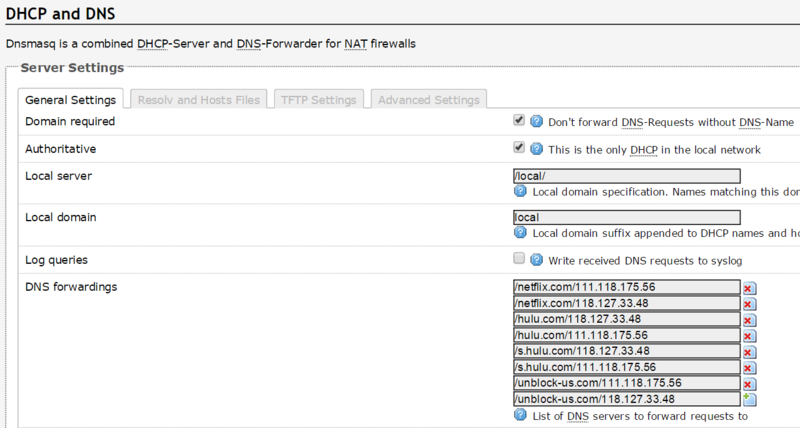 I believe the Netflix app has hardcoded Google DNS as their resolver, so doing the above would break that. Ultimately I think we’d need to use something like BIND on the router to masquerade as 8.8.8.8 then redirect based on the hostname. FWIW, the following entries in /etc/config/firewall seem to work to redirect the Chromecast to unblock.us. I like that a bit better than the raw iptables call. Re my last comment, the directives below each ‘config redirect’ line must be indented. Or just use UCI to set them.